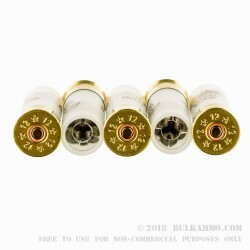 Rio's 12 Gauge 00 buckshot has been one of our most popular buckshot loads for many years due to providing great quality at a very competitive price point. This full power load exits the barrel at 1,345 feet per second delivering 9-00 buck lead pellets to stop a deer or home invader in its tracks. 12 Gauge buckshot has become an increasingly popular choice for home defense due to a great lineup of purpose built shotguns combined with the inherent advantages of 00 buckshot's lethality. Note that shotshell length is measured as the fired length of the shell and so depending on the crimp technique the shell's length varies slightly before being fired. Rio uses a roll crimp technique which is slightly longer than the star crimp technique before its fired and as a result in some shotguns this may result in one less round fitting in your tube. Good quality at a decent price. Just got back from the range shot about 80 rounds of these, and another 150 other just running some drills. This put 9 out of 9 pellets in a 2x4" plate at 12 yards, and 7 out of 9 at 25 yards with an 870 with a 18.5" and 24" barrel. Just got myself a cheap Stevens 320 bead sight shotgun. It eats these rounds up. It has "lower recoil" a hair. But the 320 is a lighter shooter as it is a polymer stock set up. So rounds will beat you up regardless. Use them as my home defense loads. All in all these are great rounds for the price. Will be getting another batch soon. A whole lot of bang for your buck! Use it in officers semi annual shotgun training. 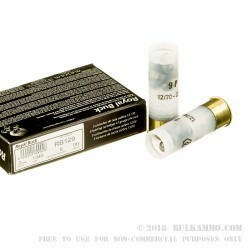 Always performs as well as the high priced rounds..... Rio is a very deadly 00 buck round. I clean and service company shotguns, and I have found that Rio is also very clean. It is now our duty, carry ammo. Great product, Great Price !!! Bulk Ammo Does It Again!!!!! Wasnt sure at first, thought I would be sacrificing quality for price...was I ever wrong! Best Ammo for Little Money? You Bet Your A**!!! I have a lot of this Buck Shot and I'm buying more. I have no doubt that zombies are intimidated by RIO Royal, but I'm worried about the more sophisticated predators. 1345 FPS, and high brass for this price is great, VIVA RIO. I have significant stock in one of the other brands also, but they use low brass on their Slug, and 00 buck loads, something I look at when shopping. My 11-87 is picky on eating re-loads and factory #9, wont cycle them. Buck functions flawlessly in the 870, the Ithaca 37, the 11-87, and the Beretta AL390. It's important when having to stock and carry multiple selections of ammo. SHOOTS GREAT OUT OF MY SAIGA 12 WITH NO FAILURES SO FAR. Q: I’m looking for at least a 1325 FPS to break in my Weatherby SA459. What is the velocity of these rounds? A: Hello Bobby, Rio lists the muzzle velocity of their standard 00 Buck at 1345 fps. Q: Is the wading fiber or plastic. If fiber, what is the melting temperature compared to plastic wading? A: Hello Patrick! While Rio does load a 00 Buck round using a fiber wad, this specific product is loaded with a standard plastic wad. Q: Lead or steel shot? A: Rio loads their 00 buckshot with lead shot. All components used are non corrosive. Q: Would this work in my Saiga 12 it needs a lot of pressure to cycle the next round..
A: Yes, we just shot Rio Royal buck in a Saiga 12 a few days ago, it functioned perfectly. Q: what is the country of origin for royal ammo? A: Rio Royal shotgun ammunition is manufactured in Spain. The company has been in operation for over 100 years. Q: Is this product suitable for home defence and what is the shelf life? A: This Rio Royal 00 Buck would be a great choice for home defense. Properly stored in a cool, dry place, this ammo should be reliable for decades. 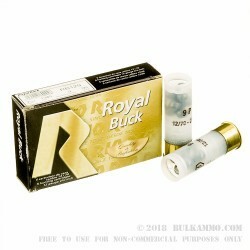 Q: Do you offer further discount prices for larger quantities such as 1000 rounds of Royal Buck? A: At this time, this is the lowest price we can offer on orders under $25,000. We are always striving to bring the best prices to our customers. A: Any round that will quickly incapacitate a violent attacker will also have the ability to penetrate interior walls. 00 Buck is a good choice for home defense use. Q: Thanks to the survival podcast network for leading me to your site. My question is I'm looking for a great home defense load but don't want to much over penetration so slugs are out should i go with the 00 Royal Buck shot or a small game load I don't want to be blowing threw walls thank you. A: This 00 Buck ammo will still penetrate multiple interior walls, as will any ammo that is sufficient for home or self defense. 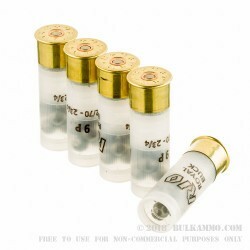 Q: How does this ammunition compare to the Winchester Ranger 12 guage buckshot ammunition? A: This Rio Royal 12ga buckshot is comparable in terms of velocity and number of projectiles to the Winchester Ranger 00 Buck ammo. It is also loaded by a Spanish company that has been in business for over 100 years. Q: I am not familiar with this Rio Royal brand. (a) Where is it manufactured? (b) How does the recoil compare to the S&B 2 7/8" 12-pellet buck (my favorite 00 load for a long time)? A: Rio Royal ammo is manufactured in Spain. S&B buckshot is great stuff, but this Rio Royal will probably recoil a little less because it has 9 pellets instead of 12 (although it does drive those 9 pellets to a higher velocity than the S&B). However, as you know, the S&B 00 buck load does not have a huge amount of recoil to begin with. Q: Would this round be considered high brass or low brass? What is the difference? A: These shells are high brass. Both low brass and high brass can be reloaded and have comparable strength. The difference is the amount of brass that makes up the side of the shell - low brass is about 3/8", while high brass is around 1/2" or more. Q: I was wondering if you could tell me the storage life of this product? Thank you. A: This is highly dependent on how you store the ammo. Stored improperly, it could become useless overnight. Stored properly (in a cool, dry place away from heat sources and moisture), it could last for decades. Q: Where are the ingredients from and were they made in usa? A: Rio Royal ammo is loaded in Spain. The company has been in business for over 100 years.